From Friday, November 9-Saturday, November 10, the Stamps Gallery hosted its inaugural symposium,Talking About a Revolution: Art, Design, and the Institution. Over the course of two days, the gallery presented thirteen individual presentations; an exhibition tour; three panel discussions; a special performance entitled Emergency Rave by Brendan Fernandes; and even a ping-pong tournament thanks to Buster Simpson’s (MFA ‘69) interactive installation Prussian Blue (Ping Pong Table). The symposium was programmed in conjunction with the Stamps Gallery exhibition Have We Met? Dialogues on Memory and Desire. During the symposium’s exhibition tour, Stamps Gallery Director Srimoyee Mitra discussed her deep collaboration with the Labadie Collection at the University of Michigan in creating a group show rooted in Ann Arbor’s legacy of social movements. The exhibition uses the civil rights movements, the anti-war movement, and experimental art practices from the late 1950s-1970s as a point of departure, but also includes contemporary works addressing the urgent call for social change. Both archival materials and artistic works are included in the exhibition. A salient portion of the tour illuminated ways that abstract works in the exhibition relate directly to this theme. 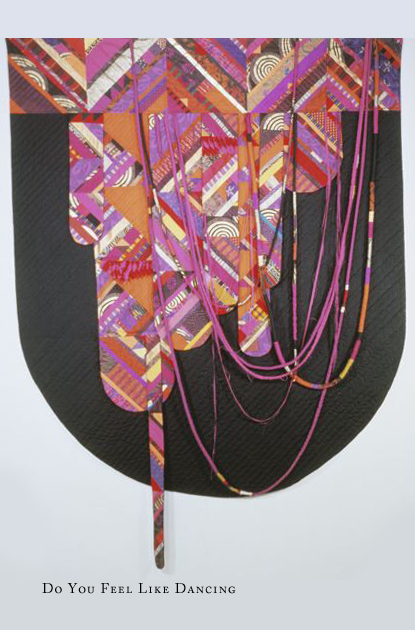 Mitra discussed the ways in which 2015 Kresge Artist Fellow Carole Harris’ textile work Do You Feel Like Dancing, 1995 defied traditional geometric patterns, exploring new forms and modes of making. Similarly, Untitled, 1977 by Al Loving (MFA ‘69) explored similar themes of breaking conventions, the works in shared conversation with one another from across the gallery. Moderated by Ingrid LaFleur, recent Detroit Mayoral candidate and director of AFROTOPIA, “Art Futures: New Modes of Organizing” brought together Carole Harris, Josh MacPhee, Jen Delos Reyes, and Gregory Sholette for what ultimately became a conversation about how artists, designers, and organizers create social change through their practice — and what institutions need to do to support this change. The panelists found common ground around the idea that artists play a powerful role in their ability to experiment with “counter-institutions” and other direct challenges to the status quo. Gregory Scholette expressed the idea that audience engagement was also critical to the process of institutional change. Scholette reflected on his work with the dozen-member artist collective “Gulf Labor Luxury Faction (GULF),” advocating on behalf of the low-wage workers at the Abu Dhabi site where the Guggenheim was in the process of building museum outposts. In April 2016, GULF projected images on the face of the Guggenheim in New York, including the faces of museum director and board alongside text in English (“Ultra Luxury Art, Ultra Low Wages,” “1%,” “You Broke Trust” and “Bad Move!”) and Arabic, Hindi, Telgu, Punjabi and Bengali, languages spoken by the construction crews on the Abu Dhabi site. “When people were watching us intervene at the Guggenheim, we could hear them saying, ‘wait — you can do that in a museum?’ It’s about the moment of transference to audience, that sense of breaking into a different kind of future,” Scholette said. The symposium continued into Friday evening very much in the spirit of community connection, with an 8 pm interactive/participatory performance piece by Brendan Fernandes at Neutral Zone entitled Emergency Rave, featuring students from the Dance Department of U-M’s School of Music, Theatre & Dance with Detroit-based DJ Nandi Comer from Seraphine Collective. An homage to those who lost their lives in the mass shooting at Pulse Nightclub in Orlando, Florida, June 12, 2016, Emergency Rave began joyously, with student dancers flaunting their best moves on the dance floor and inviting audience members to join them. Fernandes was on site, subtly directing the scene and joining the party on the dance floor. Well into the first hour of the performance, the music slowed and the bassline retreated, leaving the tiny sound of the treble line wavering eerily through the hall. The audience participants retreated as the music stopped and the student dancers bodies fell to the ground to the sound popping audio, reminiscent of gunfire. After a somber moment of silence, the DJ began a slow fade back in, gently wakening the dancers to the 1979 hit And The Beat Goes On by The Whispers. Gradually, with a fresh reminder of their appreciation of the community of the dance floor, the audience participants rejoined the scene. Celebratory, connected, and proudly defiant. At its heart, the Stamps Gallery symposium provided a chance for Stamps Students, faculty, and the general public to respond to the urgent questions and events of our time, sparking action, inquiry, and conversation. “Stamps Gallery is committed to building deep and meaningful dialogues with artists, designers, and cultural works that examine the significance of cultural institutions in the 21st Century,” said Srimoyee Mitra, Director, Stamps Gallery. As with all gallery programming, the symposium provided an opportunity to expand students’ experience with diverse curatorial, artistic, and design practices — an opportunity that many panelists took to heart, including Jen Delos Reyes. When reflecting on the needs for the next culture makers of tomorrow, Delos Reyes advocated for engaged social practice, above all else. She mentioned a grounding course entitled Organizing 101 that serves as the “kick off” to Open Engagement, an international conference on socially engaged art that she is the director and founder of. Learn more about the entire symposium line-up. Talking About a Revolution: Art, Design, and the Institution was supported by ArtsEngine, Institute for the Humanities, LSA, Spectrum Center, and the Ann Arbor District Library.